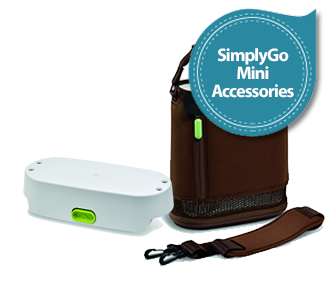 We carry a wide selection of SimplyGo Mini accessories. Please call us at 1-877-774-9271 if you have any questions. The Respirionics SimplyGo is the next generation in portable oxygen concentrators! We carry Respironics SimplyGo Mini accessories that include the SimplyGo Mini Extended Battery, SimplyGo Mini External Battery Charger, SimplyGo Mini Brown Backpack and more. We offer the lowest online prices on SimplyGo Mini accessories and always have inventory that ships same day.